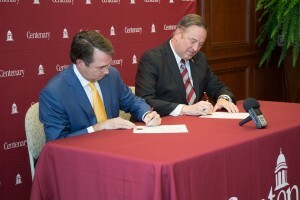 SHREVEPORT, LA — Centenary president Dr. Christopher L. Holoman and Board of Trustees member John E. Atkins signed an agreement creating the William J. Atkins Dean at the College’s Frost School of Business in a ceremony on Friday, September 14. The generous endowment given by the Atkins family recognizes the importance of the Shreveport-Bossier business community and the role of the Frost School of Business in fostering and providing leadership to this community. Dr. Elaine Labach, who joined Centenary in July 2018, will serve as the inaugural William J. Atkins Dean at the Frost School of Business. Labach spoke at the signing ceremony in the Hardy Hall of Fame Room along with Dr. Holoman and John Atkins. Holoman called the signing “a great day in the long life of Centenary” and emphasized that the endowment will provide sustained support for transformative, dynamic leadership at the Frost School of Business, one of the College’s cornerstone programs. The new endowed fund honors the memory of William J. Atkins, a long-time supporter of the Frost School of Business, the Center for Family-Owned Business, and Centenary College as a whole. The Atkins-Crawford family also provided the land that enabled Centenary to move to Shreveport from Jackson, Louisiana in 1908. View photos and video from the signing ceremony.